September 26, 2010: Tomatoes are still all green. Problem: My friend Janice loves gardening. She and her husband takes pride in their vegetable garden that they plant every year. However, the current year is different from the previous ones - their crops are late. The tomatoes are still green. They started their crops in the spring and the good weather we had presented no problems for the crops. 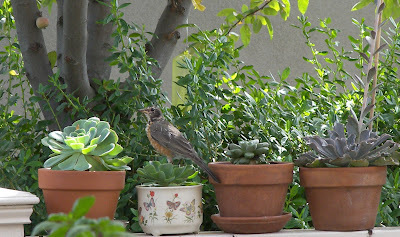 They watched the plants grow and were pleased with what they saw. Until one day the plants that were full of promise began to disappear one after another. Gophers, their subterranean enemies, launched a war against them. She was almost crying when she described the way they felt about their garden that disappeared in front of their eyes. They tried several suggested solutions to solve the problem before they finally identified the one that worked. Solution: Ammonia and dryer sheets. Who would have thought? They poured the ammonia into the holes and plugged the same hole with the dryer sheets. Then the gophers were gone. Whether the enemies died or fled to a different garden is something yet to be determined. Effect: After the gophers were gone, they planted again but now their crops are late. At the writing of this post, their tomatoes are as green as can be. They are huge but they are still bulking. It is late in September and the temperatures are beginning to feel like fall. They lost a good number of the optimum growing days of spring and summer. However this is not all bad...with the way things are it is likely that they will have fresh home-grown tomatoes for their Thanksgiving dinner and freshly made Salsa Verde to go with chips. Tomatoes loaded with healthy fruits in pre-ripening stage. Success in gardening cannot be achieved with one perfect formula. The conditions around the garden vary from season to season and present a new experience to be sought. No gardener can truly master a garden but one can master the learning process. It has been my observation that the 'Oribi Gorge', a succulent plant, has a very unique behavior when it blooms. The stems that bear the flower bend downward. It is very interesting. Natural position of the flowers in relation to the plant itself. Propped up flower to highlight details. Bright orange flowers inside powdery green sepals. This is a relatively new plant in my garden which continues to be a subject of my fascination. While wandering in one of the Redwood forests along Hwy 101 we came across a healthy patch of blackberries. Although the samples we picked were sour, one can hardly ignore the aesthetics of the reproductive stages of the plants. So I decided to talk a little bit about the nature of the blackberry fruit. Single Flower Multiple Ovaries. 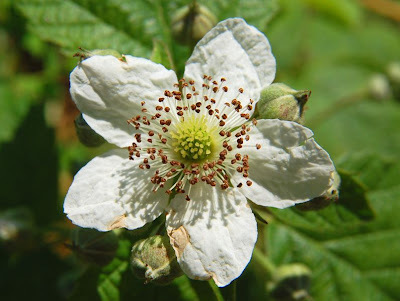 The blackberry flower is composed of multiple ovaries. Each of the yellow-green structures in the middle of the flower (above photo) is a stigma leading to an ovary that contains the ovule. The brown structures surrounding the ovary are the stamens which bear the pollen grains. Upon fertilization, the ovule turns into a seed that is enclosed in the fleshy tissue of an enlarged ovary- thus, a fruit is formed. Drupelets for an aggregate fruit. One Aggregate Fruit Many Drupelets. Multiple drupelets (fruitlets) form one aggregate fruit. The blackberry is an example of aggregate fruit in botanical terms. Each aggregate fruit comes from one flower; it is composed of many drupelets held together by a common receptacle. Individual drupelets, like any normal fruit, develop only when the ovule is fertilized. The size of the aggregate fruit is highly determined by the number of drupelets that develop. As seen in the picture below, some flowers fail to develop fruits because of unsuccessful pollination. Staggered ripening is reflective of staggered pollination and fertilization of the ovules. Staggered ripening reflects differences in time of pollination. With a cup of steaming coffee in my hand I sat in the patio doing what I like to do best - to admire the greenery laid against the cloud-softened skies. My eyes darted from one plant to another as I paid curious attention to their diverse characteristics and behavior. Then I noticed something else that was worth watching at that particular moment. 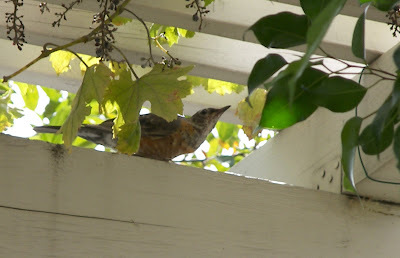 There must have been at least ten American Robins (Turdus migratorius) around me. 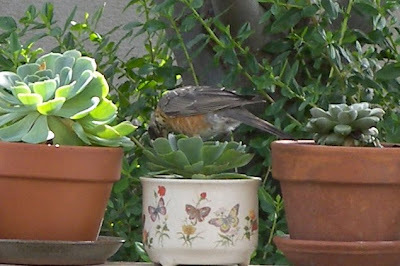 After having sat there quietly for sometime, the Robins have decided that I am a garden fixture. They did what they wanted to do around me. They were busy doing the things that I did not do this year which is to harvest the grapes. They'd fly to get some grapes and then come lower and mark the next fruit to pick. It was quiet an amazing sight to see them strategize their flights to get one grape. Figuring out the angle of next flight. Determining the position of the next target. Looking for bugs as a short break for the neck. 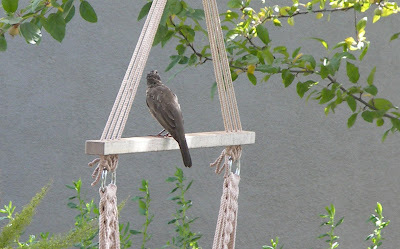 A smarter bird gets closer to the target. It's the end of September and 'Gruss an Aachen' continues to bloom as if it was still spring. Disease-free and tolerant to low watering, this rose has been growing in my yard for ten years now. I bought it from a nursery in Petaluma. This one does not get as much care as those that are growing within my immediate sight but it had shown no problems at all. In terms of growth and blooms, 'Gruss an Aachen' is responsive to pruning and fertilizing. It has been my observation that the flowers are slightly darker when the temperatures are lower as in spring and fall. Rosa 'Gruss an Aachen' is an old English shrub rose. Established in 1909, it is known to have been the first Floribunda rose (characterized by clusters of relatively larger flowers in one stem) as bred by German plant breeder Philipp Geduldig. Floribundas resulted from crossing Polyantha (clustered sprays of flowers in one stem) and Hybrid tea (shapely and larger single flower per stem) roses in an attempt to combine the characteristics of both parental types. 'Gruss an Aachen' successfully reflects the desirable characteristics of its parents ('Frau Karl Druschki' x 'Franz Deegan') in one plant - multiple blooms per stem with larger shapely flowers. Gruss an Aachen means "Greetings to Aachen". The rose was named so as a tribute to the city of Aachen. Repeat-flowering shrub rose that loves the sun. The dark green glossy leaves showed resistance to diseases. Yellow stamens add contrast to the soft pearly pink petals. Rounded and fully double flowers. Floribunda: Clusters of flowers in one stem. Rosa 'Gruss an Aachen' - beautiful, fragrant, and easy to grow. 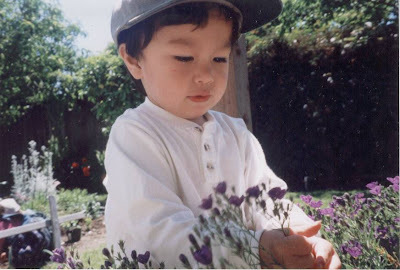 Then: Fascinated by colorful flowers. 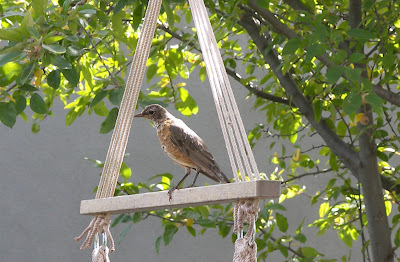 In the yard of our old house, was my kids' garden. This is unlike any other garden; it is a small patch of dirt where my they kept themselves entertained while I did my own gardening. Here, my son planted and watered flowers that he and his sister had picked. Believe it or not those flowers stay fresh if watered the way my kids did. Sometimes I replaced the flowers when they wilted...but then I realized that I was fooling my kids and myself. So I began to teach them about plants. We started by identifying the poisonous plants in the garden. Today my son Brahms turned fifteen. Hooray! Not only has he advanced chronologically, but also horticulturally. As a smart and hard-working sophomore, his busy schedule includes extra curricular activities like Robotics, Chess Club, Christian Youth Band, and AWANA (leader-in-training), etc. However, in the midst of all these he finds time to do some gardening. Now: Amazed by some tropical vegetables. 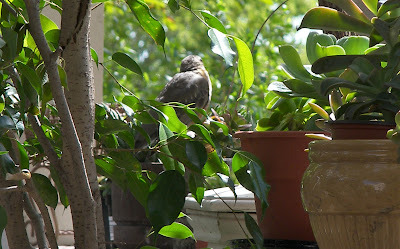 For fifteen years now he has watched me tend a garden. I think he made up his mind - that gardening is indeed a good thing. There is a sense of joy that emanates from the knowledge that this son of mine is going to know how to raise plants for food and beautiful surroundings. Like plants, gardeners clone themselves by training someone to do the same. I was delighted to hear that my friend’s son, Erich, announced that he wanted to grow his own avocado tree. Being someone who advocates gardening, I decided to help him achieve this dream; I stated to germinate four avocado seeds for him using my self-proven paper towel and sandwich bag technique that I described in an earlier post. I kept the sandwich bag that held the seeds near the kitchen sink and close to the window for some light. Emergence was observed beautifully - the radical (the first root) and the plumule (the first shoot) growing in opposite directions. Everything was happening as I had expected. Death of the main shoot resulted in branching. Apical Dominance. The growth from the embryo was thwarted by the lack of light in the cabinet. The initial plumule and radical died back and apical dominance was broken - allowing several, instead of just one, shoot to grow. This is similar to the phenomenon that occurs when any plant stem is decapitated or stressed - lateral branching is increased. Auxin, a phytohormone, is produced in the growing points of a stem or root. When the dominant stem loses its strength the lateral branches gain power. Absence of Chlorophyll. The lack of light is clearly manifested in the color and growth behavior of the new shoots. When plant tissues get any amount of light, the presence of chlorophyll becomes evident. In the case of these seeds, the shoots are white to pink which indicates that they have never seen the light. Stress on the main root induced the growth of lateral roots. Have you ever wondered where the produce you see in your grocery store came from? Well, if you are in the US, Canada, Japan, and Europe, it is likely that you will find something that has been grown in California. The Mediterranean climate of California which stretches along the Pacific Ocean provides the perfect growing conditions for many crops. Travel north or south along I-5 or Hwy-101 along the length of the state, keep your eyes open and the landscape will speak about the productivity of the land. Last month when we went on a college tour for my older daughter I took some pictures of the fields along the way. My family used to live in Hollister where every freeway that leads us out of the city goes through farms of some sort. Depending on the road that you take you are submerged into a different smell. Gilroy definitely will surround you with a garlic smell for miles as processing plants push out aromatic steam into the atmosphere. Then you come to a place where most of the vegetables are processed and you feel like you're near a pizza factory. Eighty percent of the fresh and frozen strawberries that reach the market today come from California. Watsonville, nicknamed The Strawberry Capital of the World, is a small town with strawberry farms that seem to go on forever. Watsonville, California: Strawberry capital of the world. California is semi-arid - water is an important resource. Portable toilets for the farm workers. The recent news regarding the alleged presence of E. coli on fresh produce (spinach and lettuce) have scared most consumers. Nonetheless, something good comes out of incidents like these. We are scared of the effects of the contaminants on our health but the farmers are even more concerned because their family livelihood is at stake. The whole family and estate is jeopardized when their produce are contaminated. They don't sit pretty and watch us all die. In fact while we scramble to choose which brand is cleanest, they probably work hard and brain storm for ways to deliver the best for the consumers. If the veggies you ate today did not come from your garden, where did it come from? Time is of the essence. Two weeks ago we've started harvesting peaches only as we can eat them. Peaches on yogurt, peaches with ice cream, peach crisp, peach pie, peach cobbler and...peaches again? Now they all need to be harvested to defy the effects of gravity. If I do not act now, these plump, sweet and juicy fruits will turn dimpled, sour and old. Indeed, it is not time to rest for the gardener. Marks of the past. Early in the spring the tree was severely infected with Taphrina deformans or leaf curl. 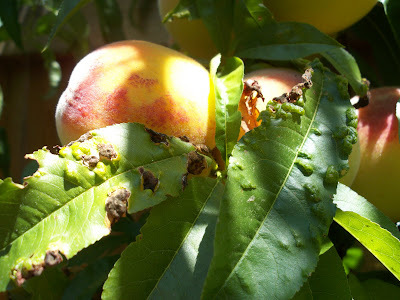 Wet and cold weather prolonged the infection that some of the fruits were affected. Some of the leaves show some reminders of the previous infection. I marvel at they way this tree persevered through all that stress. By early spring, the tree was totally defoliated by the fungal leaf curl. However, as soon as the temperatures got warmer new leaves developed and they photosynthesized like there's not tomorrow - filling up all the fruits that developed. Every fruit will have to come down one way or the other. Maintenance. The fruits no matter how high they are will come down to the ground to join the earthworms. When you have fruits like these you've got to include one more item in your daily to-do list: collect and dispose of all fallen fruits. Otherwise, our four-legged friends are encouraged to visit frequently or even reside in the yard. I've learned this the hard way when I left grapes unharvested last year. The raccoons decided that my garden was going to be their nighttime rendezvous. 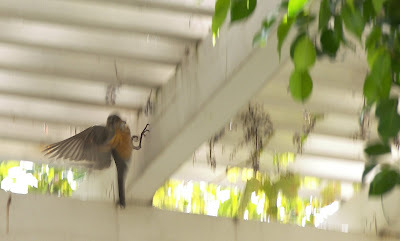 Rodents (mice) also enjoy sweet fruits and like to build nests for their young near a good source of food. As a gardener I usually encourage wildlife to find refuge in my garden but I seem to discriminate against racoons and mice. Frankly, I prefer pruning, weeding, and fertilizing over canning.